Posted by admin on Oct 15th, 2018 and filed under Frontpage, News. You can follow any responses to this entry through the RSS 2.0. Both comments and pings are currently closed. As political candidates continue to emerge ahead 2019 general elections with actors and gladiators getting ready for the showdown, the ANRP Governorship candidate, Prof Alphonsus Njoku Ekwerike has proven to standout among the pool of governorship candidates jostling for the number one position, owing to his global recognition in the field of science and invention technology. At an official endorsement ceremony last Saturday 13th October, 2019, in Owerri, a foremost political party, Legacy Party of Nigeria (LPN) closed ranks with members of project Nehemiah campaign of ANRP TO adopt Prof Ekwerike as their candidate for the number one position in Imo State. The event which witnessed the presence of project Nehemiah campaign organization, Prof Ekwerike some members of ANRP and leaders of LPN Imo chapter who presented a memorandum of understanding. The state coordinating chairman of LPN, Dr Michael Uwazurike Nnamdi Ibe noted that the adoption of ANRP’s gubernatorial candidate was aimed at building synergy and strategic partnership in order to create a strong political presence in Imo. He also stated that the need was to enhance democracy thereby providing quality and sustainable leadership through harmonized/Enhanced/ and adherence to a manifesto in achieving their goals and objectives to offer hope to the advocacy of good governance in Imo State. 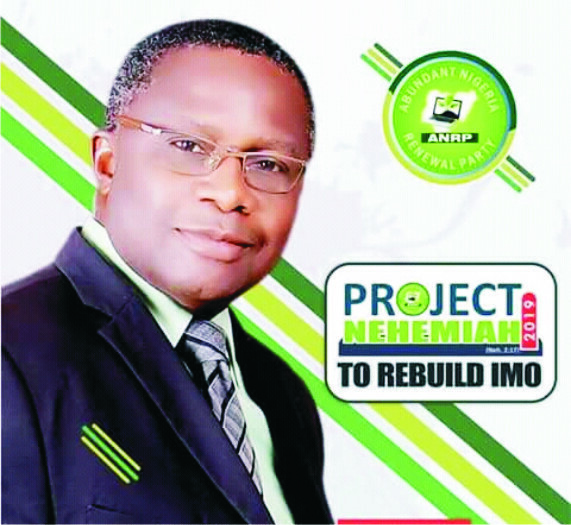 The renowned Neurosurgeon and two time commissioner in Imo state, revealed that he was committed to working for the success of the ANRP governorship flag bearer through project Nehemiah to actualize the vision for the better, “am not seeking for position, am trying to ensure the right person picks up the mantle of leadership in Imo, I have decided to work for the victory of Prof Ekwerike for 2019 guber”. Dr Ibe submitted. Responding, Prof Ekwerike commended LPN Imo state chapter for their belief in his vision towards changing the course of Imo state and promised not to fail if given the mandate to govern. The internationally recognized invention technologist with numerous accolades for his research findings exposed available 260 (two hundred and sixty) mineral resources deposited in Imo soil, waiting to be harnessed, this he said will make Imo state financially stable with less need for Federal allocation and loans owing to the backlog of accrued debt by the state recently. The Prof of Neurendocrinology who doubles as a journalist wondered why, unlike the Executive, Judiciary and Legislative arms, the fourth estate of the realm have no defined place in government or politics and promised to unveil his blueprint for journalists to be recognized as he called on journalists in the state to key into his vision. According to the inventor of STEM technology program “I have been sent by God through project Nehemiah to serve and not to rule because my means of livelihood is not politics”. “I have been favored by foreign associates most especially in the United State of America, based on my track records and data, they trust in my abilities to govern, develop and rebuild Imo, that’s why they promised to come here and support my vision by investing in diverse sectors”. “I believe ANRP with all coalition will change the face of governance, I choose to adopt a style of governance where equal participation will form the fulcrum of our government”. “During my administration, our collective wealth will not be dependent of federal allocations and loans to get all the sectors to optimum for a result oriented government, but rather we’ll engage every Imolite, make them employers of labour as there will be reduced unemployment under my watch”. “As you have seen me so I shall be in government and after government, so I pledge”. He assured. Abundant Nigeria Renewal Party (ANRP) a political association having fulfilled all the necessary conditions for registration as a political party to paragraph 15.6 part 1 of the third schedule to the constitution of the Federal Republic of Nigeria 1999 (as amended) And Legacy Party Of Nigeria; (LPN) a political association having fulfilled all the necessary conditions for registration as a political party to paragraph 15.6 part 1 of the third schedule to the constitution of the Federal Republic of Nigeria 1999 (as amended). Following terms and conditions with passionate desire towards ensuring a sustainable Nation despite the enormous challenges in-mind and aware of the past, deem it necessary to work together to enhance our democracy; provide quality and sustainable Leadership in our Nation. To Exploit and Build synergies with strategic partnerships (individum /organisations) avoid fragmentation, non competition but create and sustain a strong political presence in Nigeria. Workout transition programmes during and after elections for the party future mutual potentials. The Manifesto of both parties shall be Harmonized / Enhanced / Adhered to as our manifesto in achieving our aims and objective and offer hope to the Advocacy for good governance in Imo-State and Nigeria in general as professionals in politics. In consideration of the above, we shall look into the structure of your campaign and if necessary make input. For our own effort, we demand forty percent of appointment and elective positions. All material and financial donation through LPN for this project must be utilized immediately for this project. Any remainder after the campaign will be shared at LPN-60% and ANRP- 40%.